Jose Martí speaking from the home of Teodoro Perez at 1125 Duval St. The property is now a guesthouse known as La Te Da, short for La Terraza de Martí. A postcard dated 1906 of the Havana-American Cigar Factory with four interior images. A drawing of the original San Carlos Institute. It was on Fleming Street. 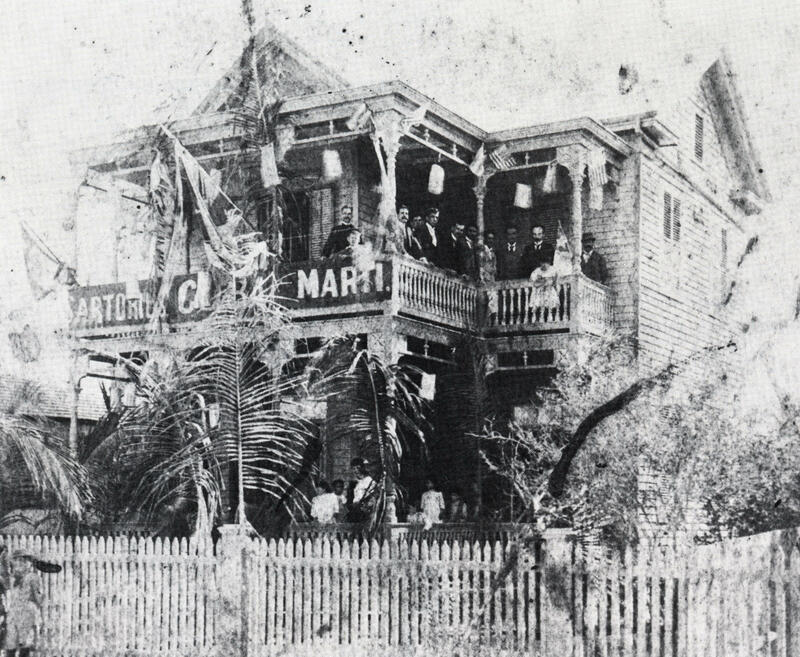 After it burned down in 1886, a new structure was built on Duval Street, at its current location. La Vista de Gatoville cigar box label. Neighborhoods around cigar factories were like company towns, so the area around the Gato factory was called Gatoville. Louis E. Neuman & Co. cigar box label. The steamship Cuba departs Trumbo Point in Key West. A postcard showing the steamship Cuba, which ran from Tampa to Key West and Havana. A postcard celebrating Domingo Rosillo, who made the first flight from Key West to Cuba in 1913. The San Carlos Institute on Duval Street was built by Cuban exiles. After a hurricane in 1919 the Cuban government paid to rebuild the structure. It has been a Cuban consulate, school and movie theater. Today it is a museum and cultural center. 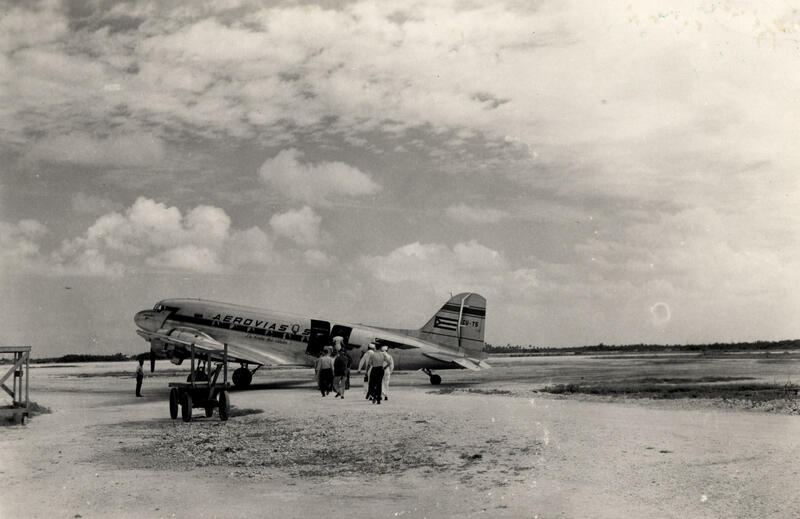 Aeromarine Airway began flying between Key West and Cuba in the 1920s. The Cuban Martyrs plot in Key West Cemetery, from the 1930s. An Aerovias Q plane at Key West Airport. An Aerovias Q plane with crew at Key West Airport. The Cuban Club at 1108 Duval Street was a social center for the island's Cuban-Americans. It burned down in the 1980s. "Key West was the capital of the Cuban exile at the time," said Rafael Peñalver, president of Key West's San Carlos Institute, founded by Cuban exiles in 1871. "It was the Miami of the 1870s and 1880s." The San Carlos was an idealistic community center that hosted cultural events and political meetings. And it was a school — an integrated school — that held classes for Key West kids of all races. "The classes were taught here in Spanish in the morning. The kids would then go to their homes for lunch and they would come back and repeat the same subject matter in English in the afternoon," Peñalver said. "That tradition continued for 100 years." The immigration to Key West began in earnest in 1868 at the start of the Ten Years War, a failed uprising against Spanish colonial rulers in Cuba. "Many people thought their lives were in danger, so many people started seeking refuge outside of Cuba," said Alejandro Pascual, who wrote the book "Key West: Passion for Cuba's Liberty". They also came to Key West for jobs in the island's growing cigar industry. Tobacco factory owners would import tobacco from Cuba and the cigars were rolled in Key West. "That way they avoided the custom duties," Peñalver said, "and it made the finished cigar much more competitive to sell in the American market." By 1876, more than 2,000 cigarmakers were producing 62 million cigars a year. That made Key West rich. And it made Key West Cuban — by the middle of the 1880s, one-third of the island's population was born in Cuba. And it didn't take long for the newcomers to start winning political office. Key West elected a Cuban-born mayor, Carlos Manuel de Cespedes, in 1876. Cubans also represented Key West in the Florida Legislature and served as justice of the peace and county judge. The new arrivals kept their identity, with Spanish-language newspapers, along with restaurants, pharmacists, doctors and others who catered to them. But they were welcomed for the most part, said Pascual. "A great part of that was the fact that the Cubans worked in the tobacco industry, which was something somewhat new that they created," Pascual said. "They didn't take jobs away from anybody. It's not that they came and they took away jobs from the wreckers or from the spongers." And there were other benefits. "The city probably smelled great," Pascual said. "Think of that!" In the early 1890s, Key West's poet-patriot hero Jose Martí started visiting the island, raising money and trying to unite the different exile groups that wanted to overthrow Cuba's Spanish rulers. "There was a routine every time Martí came to town, a beautiful routine," Pascual said. "It would be like a holiday in town. About 5,000 people would go to the port to wait for him. There was a band here in the San Carlos called La Banda Libertad, a music band, that would go to the port. [There were] American and Cuban flags. They would parade him down Duval Street from the port, past the San Carlos, all the way to La Te Da." Today La Te Da is a guesthouse that hosts drag shows and tea dances. Back then, it was the home of Teodoro Perez, a cigar factory owner and friend of Martí. "That is why that place is called La Te Da," Pascual said. "Because the Cubans would call that place Martí's Terrace, La Terraza de Martí." That name got shortened to La Te Da, "the same way as Key West became Key West, from Cayo Hueso," Pascual said. In 1895, Martí returned to Cuba and was killed in his first battle. Three years later, the USS Maine left Key West for Cuba and exploded in Havana Harbor, leading to the Spanish-American War, in which American and Cuban troops defeated Spain. But even after Cuba's independence in 1902, traffic continued across the Florida Straits in both directions. 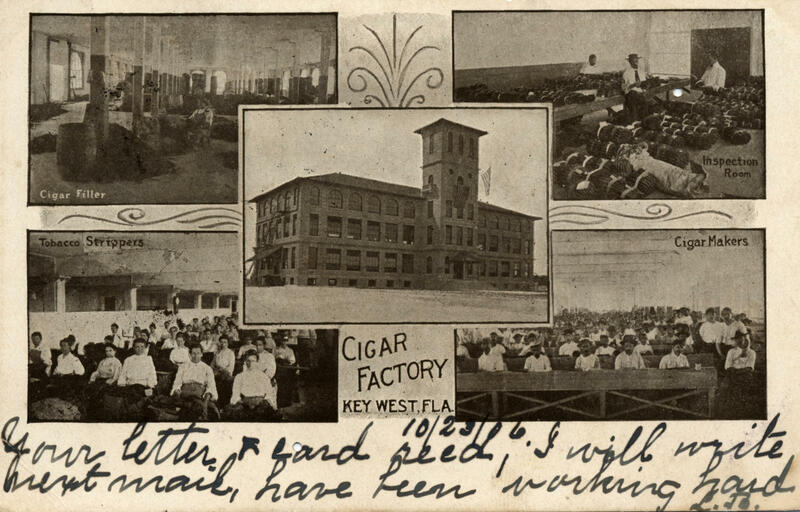 Even though many cigar factories had moved to Tampa, the industry in Key West was still sizable. And Key West wasn't yet connected to the Florida mainland, so the only way off the island was by boat. "It was much easier to travel 90 miles through deep, safe water than it was to traverse the very dangerous shoals between here and Miami," said City Commissioner Tony Yaniz, who was born in Cuba. "And there was not much in Miami back in those days." The new Cuban government was friendly to Key West. In 1919, when the San Carlos Institute was destroyed by a hurricane, the Cuban government provided $80,000 to rebuild it and sent their best architect to design it. "He designed the San Carlos as a great casona Cubana, a Cuban mansion," said Peñalver. The building at 516 Duval St. has all the elements of classical Cuban architecture. The design "incorporated many of the elements of Cuban architecture, the high ceilings, the massive wooden doors, the Spanish mosaics that decorate the walls of the San Carlos, the black and white Cuban tiles hand made that we have in our floors," Peñalver said. The building still technically belongs to the Republic of Cuba. While the U.S. had diplomatic relations with Cuba, it served as a Cuban consulate. Today it is a cultural center and museum. The rise of cigarettes after World War I and the Great Depression finally killed off Key West's cigar industry. But many of the cigarmakers stayed, like Maggie Hernandez's grandfather. She grew up in Key West and remembers hearing the numbers for the bolita, or Cuban lottery, read out on the radio. "If you went down the street, you could hear the radios going in people's houses. Nobody had air conditioning so all the windows were open and you could hear cien peso, di di di — you know, the bolita," Hernandez said. Locals played their own version, based on the numbers from Cuba. Once, Hernandez's father won $1,000. In the 1950s, Hernandez worked for Aerovias Q, the airline that ran up to five flights a day between Key West and Havana. The flights lasted 45 minutes and cost $10 each way. Hernandez announced departures and arrivals in English and Spanish. She went to Cuba frequently herself, to visit family, shop or see a doctor. Key West was a small town; Havana was the big city. And while Key West was primarily a Navy town in those days, there were some tourists who would come for the week to fish. "And then, on the weekend, fly to Havana, have a great time," Hernandez said. "There were a lot of casinos there. Cuba didn't really envy anything of the United States because it had everything. Everything." After Castro took power and regular travel between the U.S. and Cuba stopped, Key West took back its historic role as the first stop for exiles fleeing political oppression and seeking opportunity. That was true in the Mariel Boatlift of 1980 and again during the Rafter Crisis of 1994. Cuban Conchs like Maggie Hernandez said Key West is less Cuban today than it was when she was growing up here. But cafe con leche is still the fuel that powers the island. And a relative newcomer like Pascual, who retired in Key West in 2006, can detect the island's Cuban roots. "You might meet someone here whose last name is Smith, and then you start talking to them and they say, 'Oh, my grandmother's name is Mariarosa and she's Cuban,'" Pascual said. "There's a lot of people that you don't realize have Cuban blood. Some of them speak Spanish and some do not — but they all like black beans. They all eat black beans at home." Pascual left Cuba as a teenager in 1964 and has lived all over the U.S. and Latin America. "Part of the reason that I live here is that I feel pretty much at home here," he said. "I belong to two cultures and I feel here, I can be Cuban, I can be American. And I'm both." How Will Changes In Cuba Policy Affect Florida's Economy? This was originally posted on Dec. 23, 2014 from WMFE. Impassioned reactions continue to pour in over the political and social implications of President Obama’s plan to normalize relations with Cuba. This week, 90.7 economic analyst Hank Fishkind takes Nicole Creston through the economic implications for Florida and for our region. Cuban baseball players live a great life compared to other Cuban residents. They make approximately $40 to $200 a month with a few extra bonus incentives, a much better salary than the average Cuban's. They also get better housing, an annual bonus and the coveted privilege of traveling. When President Obama announced last month that he planned to restore diplomatic relations with Cuba’s communist regime after a half-century of bitter estrangement, no one heard from former Cuban leader Fidel Castro. And no one really cared.